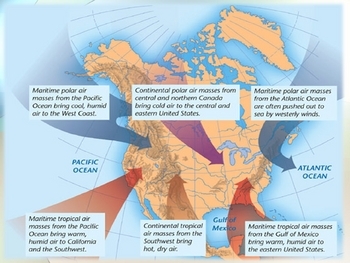 This is a 52 slide PowerPoint lesson which describes the types of air masses; maritime, tropical, continental, polar. The types of fronts; cold front, warm front, stationary front, occluded front. 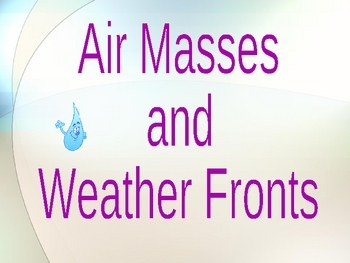 The symbols that each front represents on a weather map as well as the difference between high and low pressure. It also looks at weather maps and how to read them. It has many different graphics, pictures, and animations that reinforce the topics. 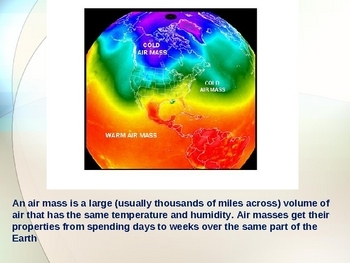 Addresses the Common Core Earth Science strand weather and the atmosphere. It also gives students the opportunity to be a weather-forecaster on TV. The Preview Sample is the free Student Note-Taking Guide that accompanies the the Power Point. Enjoy!